Microsoft continues to be the most applied technology gateway for business networks. 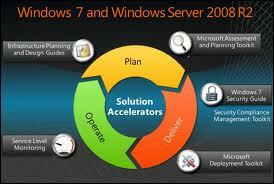 In the recent past there were concerns on the Windows Server Series from 2000 – 2003 especially on information security. Microsoft products have evolved to include self analytical programs to complement this. In this range there exist Windows Defender, Windows Firewall, Forefront and Baseline analyzer. All these continuously check on PC or Server or Network for recommended setting, crucial alerts like updates, malicious software and intrusion. Forefront and Baseline analyzer goes even further to mention all the above against best practices giving hints for the same. 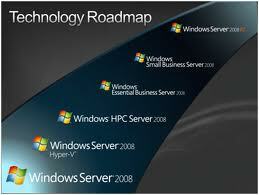 Windows Server 2008 R2 answers most of what we experienced as loopholes in terms of security to earlier versions. 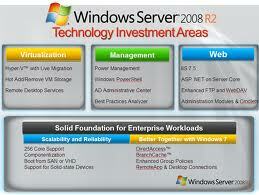 Windows® Server® 2008 R2 is a release that builds on the Windows Server 2008 foundation. Having progressed from Windows Server 2008. IS is recored that this is the second that both a server and client were released together. Windows Server 2000 was the first. And while Windows 7 is available in both 32- and 64-bit versions, R2 is the first 64-bit only Server release. Power consumption of servers has always been an issue now Microsoft promises more for less power with the Power Management module. With organization always wary of Scalability and Reliability, Windows Server 2008 R2 has >64 Core Support Componentization. With their quite catchy phrase “Microsoft Your Potential, our passion” maybe this will answer most of our earlier concerns on networks. It is also worthy to note that Microsoft will stop the support of Windows Server 2000 in 2011. Mains power always has a fluctuation and intermittent outages; this continues to pose a danger to electrical appliances and equipment. Many organizations have gone ahead and installed state of the art online generators with relay switching. This ensures that whenever outages occur then the generators start immediately. But then again they have to have transformers so that voltages either from mains or generators are regulated. Relay switches are pretty good for they channel the needed power as and when one line goes down. All that can be witnessed during this twin second transfer is a flicker of lights in the organization. Other organizations have gone further to install Uninterrupted Power Supply (UPS) for their critical equipment like computers, Servers, Surgery and ICU recovery equipment among others. This gives them an advantage when there is an outage and they have minimal if any downtime. Small UPS have become popular and readily available with a variety of brands up for grabs. They provide “clean power” to appliances and equipment and many of us relate to them either at work and or at home with our PCs. Most people have gone further to even have “fridge guards’’ that only regulate mains power to the system specific voltage. Technology has advanced that we now have rechargeable torches and lights. These come in handy when we experience outages at any one point. This can be installed in homes so that all that is required when a blackout occurs is to switch them on. Vendors have information on how best to install them as part of your electrical system. There is still a vulnerability to other equipment and appliances we have in homes. Most notably the entertainment units like the TV, Hi-Fi sound systems, Home theatres and what not. These cost quite a load of cash. Therefore it is imperative to protect them too. Qualified electrical vendors can give you a professional assessment of what you want to achieve. 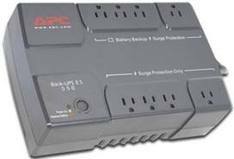 Be it just surge protection where you could just buy a surge protector single socket or multi socket. If you need a solution to not only provide “clean power” but also give you uptime then UPS is advisable. You need to get the power load estimate of your equipment plus 30% power factor which will give you the maximum load. This value will be used to calculate the UPS output required. For required uptime then the same value will be requisite to calculate the UPS output required to give desired uptime. Full Power Back Up Solutions for homes are available so that nothing goes off when blackouts occur. Power firms and equipment vendors have them. Risk of equipment damage can only be best covered by investing in professional services and a quality product. If that is no insurance then try risking your valuable equipment on raw mains power. Soon what has been only possible in science-fiction movies will be ours for the taking. 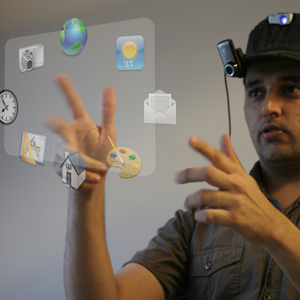 The developer of sixth sense systems Pranav Mistry, using camera projection technology. He announced that soon the system will be available in the market fully licensed. It will have an approximate price of $350. The system is a camera and projector worn on the head by the user linked to a computer. The system will be able to record everything the user sees, with a capability of monitoring gestures. The gestures recognition will apply to those made by colored fingertips. The camera and projector will be connected to a computer that has internet access. The footage on the camera then can be projected inform of a hologram and the user could even navigate with gestures,. Moving, placing and clicking on displayed on the hologram. Mistry says after purchase it will be open source so that people can model their own futuristic experience. He also reasons that this kind of technology is hard to market so it is best for owners to be able to customize or complete re-design it to meet their needs. This initiative could be a breakthrough to e-lerning especially preschool where kids at that age learn a lot from sight, sound and gestures. 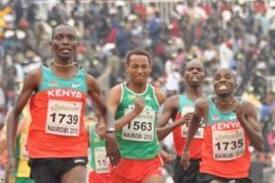 I wish to thank the team coaches, athletes and all goodwill supporters(in kind and deed) behind the Kenya team that has harvested more than enough share of medals at the Commonwealth Games in Delhi, India. And to all other Kenyan wins in globe competitions during the same period most notably Rushisha’s Gold and world record breaking and Wnajiru’s Gold in the just concluded Boston Marathon. 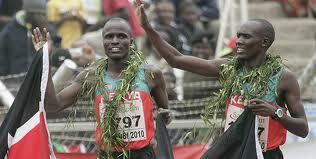 All Kenya sportmen, innovators and more lets learn from this and make a difference. The news of successful arrests with live footage evidence is something corruption in Kenya will have to reckon with. 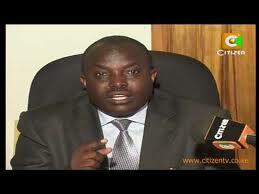 Congratulations to the KACC team and the brave cooperative Kenyans willing to go all the way. Keep it KACC! 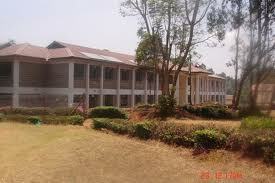 This is one of Africa’s most prestigious schools. With a winning legacy spanning over 50 years. 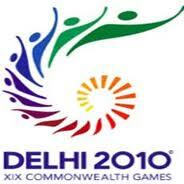 A star-studded Alumni fraternity; holding key positions in government and private sector. Located in the lush of Kikuyu county on a 50 acre plus compound. The rich tradition passed over the years as governed by the strong Christian values ensure the required grooming to performing students. It is the dream of one too many primary pupils. The case in point is Alliance High School tuition fees. As a guardian to my brother this I have observed for four years now. As a family we rejoiced at the passing of KCPE of our brother and we were more than overjoyed at the beckoning of Alliance through their enrollment letter. We made a point to inquire closely from the then Principal, scholar and mentor Mr. Khaemba. We were of the view that our brother could not make it to the school for the costs involved were quite prohibitive. He couldn’t hear any of that, he convinced us and re-assured us that the cost will not only be worthwhile but bursaries will also complement our efforts all through. The following year 2008, the government made an announcement and decreed the recommended tuition fees for respective categories of schools. With this news we thanked God for certainly it had taken his concern. Kenyan parents had complained for far too long and some teachers had taken advantage of unsuspecting parents. This very year Alliance raised its school fees in a very sly manner during one of its parent day meetings. Quickly mentioned, seconded and passed. Many parents in the meeting could not object given the pride they carry. Others feared intimidation from the well to do parents, many others feared the incrimination of their sons. So there it was twenty thousand shillings added to the hostels building fund. No one questioned how this could be, given that the hostels budget had already been factored and this meant a colossal sum of (Kshs. 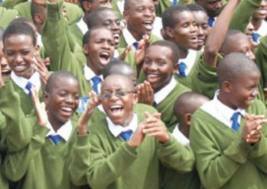 20,000 X 1000students= Kshs. 20million) an additional twenty million. Do we not have quantity surveyors, architects and civil engineers? Which building is this that costs so much?Who knows Form one parents this year might have paid an undisclosed sum towards the same. Then a harambee which raised cash then came the famous “H3 Hammer” raffle raising another sum for the same project. What pains the most is that the in same fashion they passed another increment, first term this year for the SAME project. Raising the fees by a painful ten thousand shillings (Kshs. 10,000 X 1000=Kshs. 10 million). In second term during a parents meeting, a board member mentioned, another motion was hastily proposed, seconded and passed. A ten thousand shillings increment disguised as dining hall renovation fund. As a guardian struggling to support a brother who already had a fee balance given the sub-sequent increments I wished Mr. Khaemba who had convinced us otherwise was there for us to confide in and ask of this. an increment was quickly passed in the same unscrupulous manner. 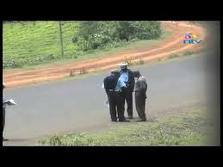 This time given a very good name ASPAS aka Teachers motivation for a tidy sum of ten thousand shillings per form four student with a total of two hundred and fifteen students was charged(Kshs. 10,000 X 215 = 2,150,000 Million). The question that begs an answer is Does the Ministry of Education allow such? Motivation for the teachers is okay but let that not be a harsh sum. We appreciate their toiling; we respect their sacrifice. Parents work hard too; they have other children to cater for. They too work elsewhere and the motivation they get for their hard work is never big as such. Even for the best employers yearly bonuses never go beyond 7%. And to push this unto parents that are already heavily taxed, peasant farmers, guardians like me and the most in need amongst us is an abomination. I understand that there are parents that will take such increments laughing but what about those who cannot? Those that took their children there on the premise of complementing bursaries? Those that are struggling with tuition fee as seen from their balances? This is adhoc fee increments are unheard of. I do call upon the Permanent Secretary, Ministry of Education to intervene. I suggest the auditing of building development funds in schools and other funds unwarranted fee increments notwithstanding. We are pushing parents and guardians into poverty. All in all we do continue to wish Alliance High School the very best now and in the coming years. With the knowledge age here with us, information is available almost on every channel on the internet. 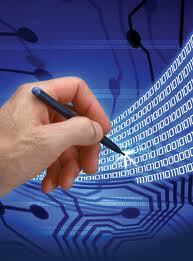 ICT infrastructure development all over the world, in countries and in organizations have seen to this. Truly communication has been made easier, no longer cost prohibitive and more convenient. This has seen the creation of hot spots in many public places; airports, restaurants, hospitals, institutions of learning and many other business areas. Now we can easily access almost anything we require on the internet. 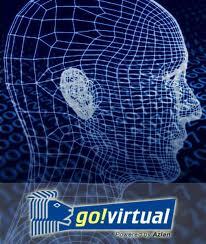 We can remotely do what we once considered mundane tasks like banking services among others. We can share with the one another and the world at large through our social sites. Our concern then should be the risk that comes with this exposure. 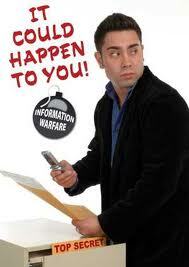 Our information is all over the internet. From our social sites profiles, emails and so much more. How do we safeguard ourselves? The complexity of cyber crime has it that fraudsters and criminals steal identities and start monitoring would be victims for days even years. Then when they do pounce on you, they have such accuracy on who we are, where we live, where we work, how much we earn, our family, our investments, achievements and just say almost everything. Already Politicians and other big wigs have already tasted this by facing blackmails for their extra-marital affairs among other exposed info to fraudsters. Information is power and to have it means being able to do extraordinary things. 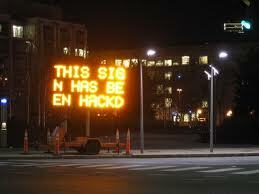 Making money illegally being the alluring factor to hackers. For organizations, procuring professional consultants to assess the risk is the first step. 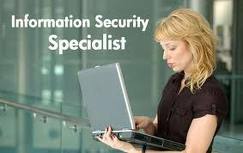 Then engage your ICT team with the consultants to formulate a formidable IT strategy in policy form, hardware configuration as well as possible software solutions including firewalls and physical protection details. The statistics from developed countries on the price they had to pay for their ignorance on this is worthy paying attention to. Already we have seen what a few rogue individuals have done to our sleeping banks on unauthorized ATM withdrawals, transfers and all. It calls on us then to be on high alert. Cyber Crime is here with us and we cannot let Kenya and the East Africa Region be a statistic.